There's a certain basic skill set that's very useful for drivers to have no matter their level of mechanical proficiency. Being able to change a tire in the event of a flat is one such skill, and it can keep you from the alternative of being stranded while you wait for help to arrive. Make sure you're parked on a hard surface away from passing traffic. Turn off the engine and set your parking brake. Before you lift your car on the jack, loosen the lug nuts slightly. 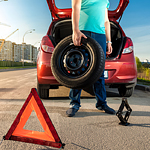 Raise your car and loosen the lug nuts completely, removing the flat tire. Replace it with the spare tire and hand-tighten the lug nuts. Lower your car and tighten the lug nuts the rest of the way using the lug wrench. If you have a flat tire or suspect your tires need replacing, don't hesitate to visit us at Heritage Mitsubishi Morrow. We'll replace your flat and have you back on the road again as quickly as possible.